1. Prepare Chimichurri Sauce. Place garlic in food processor container. Cover; process until finely chopped. Add remaining sauce ingredients. Cover; process until well blended. Remove and refrigerate 1/4 c. sauce for serving. Place beef filets and remaining sauce in food-safe plastic bag; turn steaks to coat. Close bag securely and marinate in refrigerator 15 min.-2 hrs. 2. Remove filets from marinade; discard marinade. Place filets on grid over medium, ash-covered coals. Grill, uncovered, 12-15 min. (over medium heat on preheated gas grill, 10-13 min.) for medium rare (145°F) to medium (160°F) doneness, turning occasionally. 3. 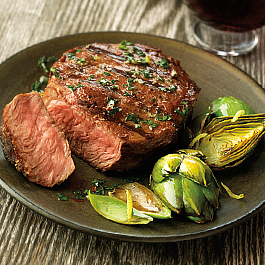 Serve filets with reserved Chimichurri sauce.